The ProgrammableFlow Networking team rolled out another market-leading version of its high performance OpenFlow Network Fabric last week. First to support the OpenFlow 1.3 standard with a generally available SDN controller, NEC also announced new levels of scalability, up to 200 switches per controller, advanced performance and reliability characteristics-including Ether OAM and IP Multi-cast capabilities, important for the big content providers. NEC has also expanded its network visualization capabilities, which of course have been integrated with the controller from inception, and include the ability to monitor end-to-end network flows from a central point. Johns Hopkins Physics Lab has implemented Version 5 to leverage the new OpenStack Grizzly interface. OpenStack Grizzly delivers new levels of stability, and coupled with ProgrammableFlow SDN, enables integrated orchestration of compute and network resources. These services build on the open ecosystem represented by the NEC SDN Application Center first announced in May at Interop, Las Vegas. Customer Rob Cannistra, of Marist College, NY. Marist is an early adopter of SDN both from an enterprise and a research perspective. He is speaking of his experience on the “End User Perspective” on Tuesday, October 1, from 3:45pm-4:30, moderated by Jim Metzler of Ashton, Metzler and Associates. Samrat Ganguly, Chief Network Architect for NEC Corporation of America, will also participate on an SDN Workshop panel from 2:15-3pm Tuesday. If you are in the New York area or attending Interop, please visit us on the show floor, Booth 437, to see working SDN today! Later in the month in NYC, NEC will attend the Open User Network Group (ONUG) hosted by JP Morgan and Lippis Consulting. ONUG will feature early adopters of SDN networking speaking on their experiences. 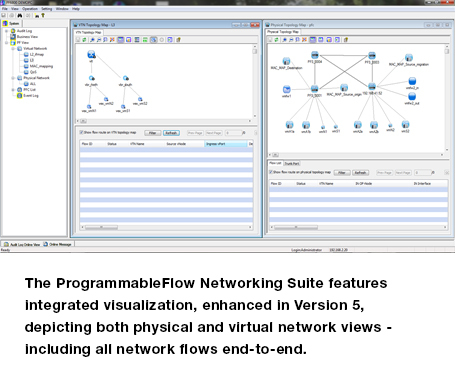 NEC will be demonstrating ProgrammableFlow Version 5 and integration with other switch vendors and third-party network and orchestration applications. Watch this video to learn more about SDN. Hey Buddy!, I found this information for you: "Healthcare Communications: VoIP and Unified Communications Solutions offer Business Process Improvements for Medical Practices". Here is the website link: http://nectoday.com/healthcare-communications-voip-and-unified-communications-solutions-offer-business-process-improvements-for-medical-practices/. Thank you.